10% OFF Tickets to “Get Me a Cab!”, A CabSauv Tasting & Clinic. Save up to 35% on hotels in San Diego. Save $30 on Legoland California Resort + 2nd day free + Sea Life Hopper. Kids Free October! Get a Free Child (ages 3-9) Ticket to San Diego Attractions with Paid Adult. Buy 1 LEGOLAND/SEA LIFE Hopper ticket, Get 2nd Day Free. Buy a LEGOLAND/SEA LIFE Hopper ticket, Get 2nd day free. 2nd visit must occur within 9 days of 1st visit. Parking is not included. Ticket valid till 12/31/2015. Get up to $31 off Knott’s Berry farm tickets. Save up to $30 on entrance into 4 popular parks – San Diego Zoo, San Diego Safari Park, LEGOLAND and SeaWorld! Get 10% off when you stay 3 or more nights at the Residence Inn Washington, DC/Capitol. Get $7 Off one day pass at San Diego. Get 20% off stay on sunday at West Inn and Suites + free parking, internet and breakfast. Get up to $31 off Knott’s Berry Farm Tickets. Visit site for details. Save up to 30% on Hotels in San Francisco. Travel by select dates. Save $7 on 1-day pass of San Diego zoo tickets. Tickets are $39 per person in advance and $45 per person the day of the event at Holiday in Carneros. Get Up to $29 off 2-Day Admission to Legoland Florida Resort. Check out San Diegos Best Value – The 3-for-1 Pass includes Zoo, Safari Park & SeaWorld entry for 7 days! No code needed. Limited time only. Get Disneyland Resort 3-Day & 4-Day Park Hopper Tickets for $22. Valid for Anaheim , CA. The Main Street Electrical Parade is home at Disneyland Park for a limited time. All 3 & 4-day tickets includes a one day Magic Morning admission on Sunday, Tuesday, Thursday or Saturday. Get discount tickets on Wine Festival at Doheny. Save up to 25% on hotels near Legoland California resort. 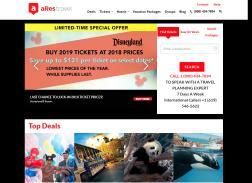 Save up to $26 on disneyland resort tickets. Save up to $34 on Knott’s Berry Farm Tickets. Black Friday & Cyber Monday Deals! Get $31.40 Off Legoland + Sea Life Hooper and 2nd day Free. Visit site for details. Ticket valid until 12/31/2018. Get $5 off gate price on 2-Day visit pass to San Diego Zoo/Safari park. Get up to $46 Off per person at Universal Studios Orlando. Save up to 35% on your stay for 1 or more nights at Lake Tahoe Vacation Resort. Visit merchant’s site for more details. Save Up to 40% on Knott’s Berry Farm theme Park Single Day General Admission Ticket. Excludes special ticket events or private parties. Save up to $25 on 2 day admission to LEGOLAND Florida resort. Second day must be redeemed within 9 days of first use or ticket expiration whichever occurs first. Get $20 off booking tickets for Universal Studios Hollywood. Valid for Universal City , CA. Offer for Limited time only. Save up to 25% on hotels near Disneyland Resort. Get 25% off your stay + Full Breakfast, free Parking & High-Speed Internet when you book 1 or 2 night stay at the Desert Palms Hotel & Suites. Save up to 20% on when you purchase tickets to 3 top orlando I-Drive Attractions.